Click here to book your wedding today! Q. 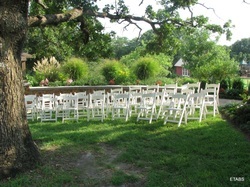 Where do the outdoor ceremonies usually take place? A. Brides Choice: Several lovely spots to choose from. There is a beautiful area by the pond with slight slope, the porch of the Wofford House, under the Pavilion and beside the Key Garden. Q. Do you have an area for the bride and groom to dress? A. Yes! Q. Can we bring in our own caterer or do we have to choose one from your preferred list? A. You may bring in your own catering service. Q. What is the seating capacity for inside the Woman's Building? A. With tables, (8 chairs per table), we suggest not seating more than 88 inside. Q. Do you offer a plan for a vows only or a small occasion? The room has a kitchen and two restrooms, 11 round, 60 inch tables with 8 chairs at each table. It seats up to 88. Accomodates up to 35 people. Accommodates up to 160 people.